Transformation from Cruiser to Racer. Both cruising and yacht racing are important to my family, this is why we set out to acquire a versatile boat. We wanted a boat that had an open and large cockpit for entertaining, accommodations for comfortable family cruising, yet still be competitive in yacht racing. 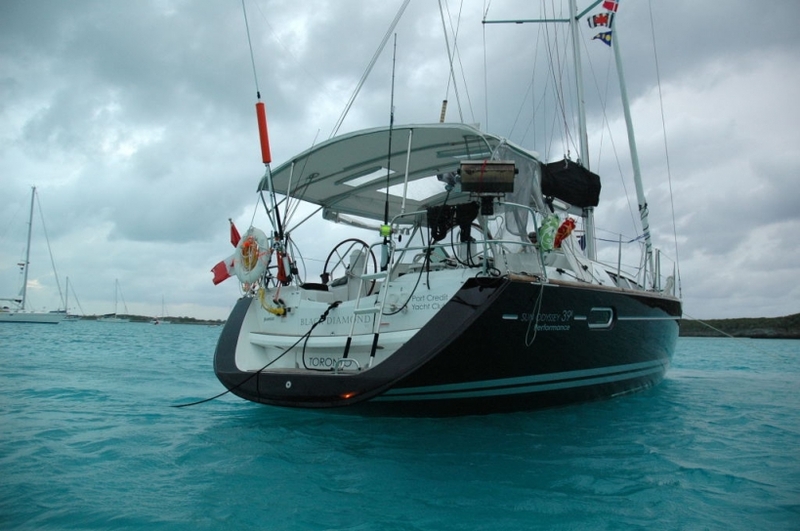 We found what we wanted in a 2008 Jeanneau 39i Performance sailboat that we named Black Diamond. After spending the winter cruising with her in the Bahamas, we brought her back just in time for the summer racing season here in Lake Ontario. Our cruise to the Bahamas began in August 2008 when we left the Port Credit Yacht Club, crossed Lake Ontario, then through the Oswego/Erie Canal, and down the Hudson River to New York City. The sail from New York City to Florida was completed about 100 miles offshore and in what I believe to be a cruising record of 5 days and 3 hours. You can imagine all the gear necessary to make this trip safe and enjoyable. I purchased a storm jib, six man offshore life raft, inflatable dinghy with an electric motor that can easily be stored in the storage room. We made good use of our storage room, keeping the deck and transom clear for some offshore racing. We were fortunate to enter a couple of offshore long distance races while away. At anchor in the Exumas, Bahamas near Big Major Spot. 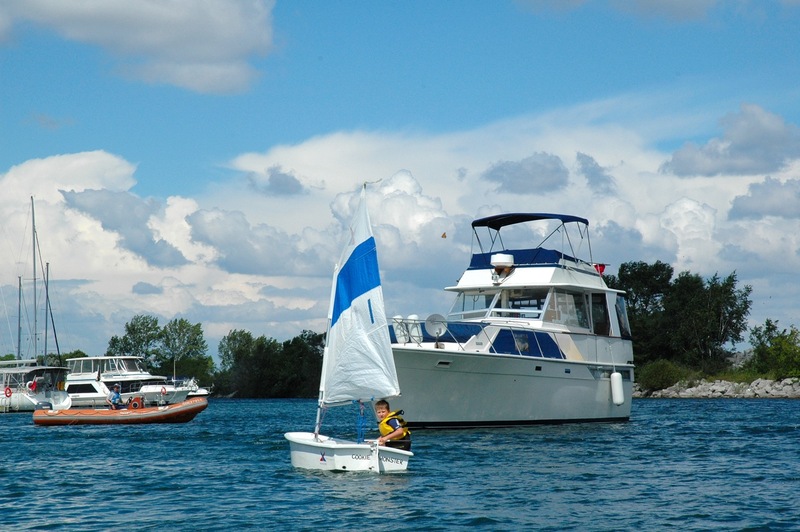 But now the challenge was turning her back into a racer for the Lake Ontario 300. Once we pulled into our slip, after a winter of cruising south, the process started with completely stripping the boat of just about everything. It is amazing how much stuff can accumulate on a boat! It took a conscious decision to remove everything, and only put back what was absolutely necessary. We removed about three van loads of gear including the dinghy, motor, fishing rods & tackle, scuba gear, beach chairs and toys, extra clothing, cleaning supplies, appliances, books and the barbeque amoung many other things. I estimated over a 1,000 pounds worth of gear in all. Next, we had to meet the LO300 offshore sailing regulations which has a very long list of safety gear that needed to be purchased and installed. However, we still wanted to keep the boat light for the race. So off came the main sail lazy jack bag and the full enclosure which consists of a dodger, bimini, transition and side walls, not forgetting all the enclosure hardware. This was not only for weight and drag, but also for clear visibility of the sails. We used this opportunity to have minor repairs done to the enclosure after a long winter down south. Then we made sure the water, waste and fuel tanks were emptied, only carrying enough fuel to meet regulations. This saved us another 1,000 pounds in weight. The salon table came out, making room for the crew’s personal gear, and keeping the weight low to the keel. 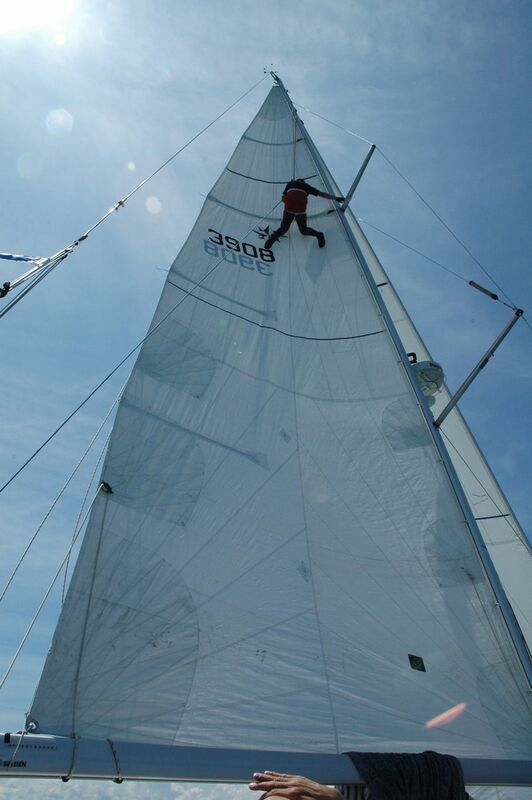 We sent a crew member up the mast for an inspection. The rig was tuned for racing, life lines and all sharp edges taped off to protect the spinnaker. We lubed all the running rigging, making sure everything was operating quick and smooth. We haul the boat out, washed the bottom then applied a coating of VC-17; this retards marine growth and provides the hull a super smooth and quick surface. The last thing that we had to take care of before the race was provisioning the boat with food. Our goal was to have good food that was quick and easy to prepare. This is very important on long distance races or cruises. Many times the weather or sea conditions make it difficult to cook at sea. Fortunately, my wife enjoys cooking and volunteered for this job. She cooked everything homemade, for six crew, for three days. She made meat sauce and put it in a Tupperware, and she even precooked the spaghetti and put in large Ziploc bags so that we just had to heat it, and serve it. Another of the crew’s favourites for lunch was the prepared egg salad and tuna salad that could easily be put between bread for a quick sandwich. We also had a large dish of homemade chili and chicken noodle soup that could also be heated up at a moments notice. Overall, the transformation took me about 3 or 4 days worth of work and a couple thousand dollars in safety gear. In preparation, it is necessary to book approximately a week off work. This includes time for Prep, Race and Recovery. All well worth the effort. We had a wonderful experience racing the LO300, excellent wind conditions for about half the race with winds 15 to 20 knots and gusting a little higher. A nice broad reach under asymmetric spinnaker topping off our speed at 10.5 knots. We were up with the leading boats for the first leg. I was very happy with our performance up until then, reaching Main Duck Island in about 19 hours. Then, just before rounding the island we ripped our spinnaker in half. What a disappointment, not for the loss of the spinnaker but for what it would do to our finishing position. The only item that was not taped off, was the radar reflector on the starboard spreader, I believed this may have put a little hole in it, that eventually caused the rip due to a long and heavy spinnaker leg. 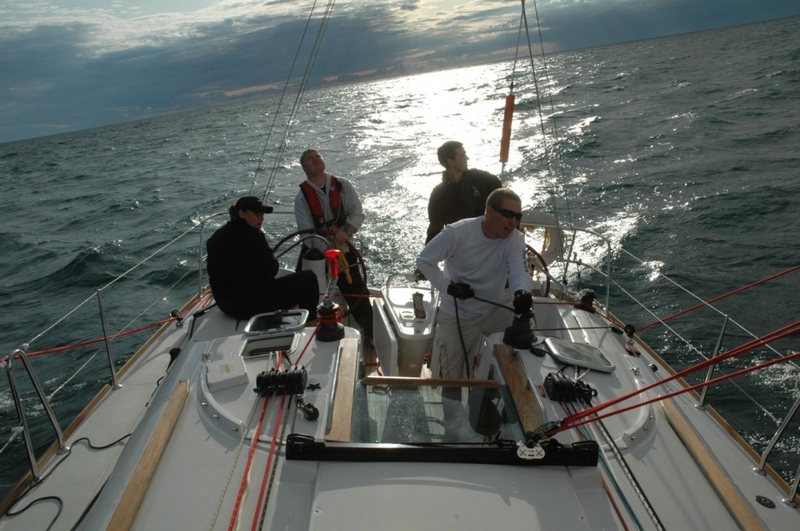 Stripped down for the Lake Ontario 300 in 2009. The next leg from Main Duck to the Oswego Mark was a close haul course in 20+ knots of wind with seas 6 to 8 feet. I could swear I was back on the Atlantic Ocean! It’s the closest you’ll come to experiencing the ocean on a lake. Our boat loves these types of conditions; we put a couple of miles between us and the boats directly behind us. We also passed 4 boats, and caught up to the lead boats again. On the leg to Youngstown we decided to head offshore, which turned out to be a bad decision. Had we stayed inshore and on the rhumb line directly to the Niagara mark, many boats including those in our fleet may not have passed us. The last leg really required a spinnaker with very light winds, this is where we lost all our time in the race this year. We did complete the circumnavigation in two and a half days, a day quicker than last year. We endured some rough conditions, heavy winds, doldrums, hot summer sun, cold evening breeze, containerships and even some seasickness, but all of this added to the experience. I would recommend the race for anyone planning a long distance passage down south, it’s an excellent training ground for ocean passages, and a good shake down cruise for your vessel and crew. I plan to continue to participate in the LO300 for many years to come. Shark Attack in the Bahamas! I read your article (1 Boat, 2 Looks) in GAM and looked up your blog this am. Fabulous stuff! I really enjoy some vicarious sailing and your blog really is great for that! Thanks a million. I am looking forward to checking out the rest of your blog and travels as time permits. Brian GAM reader, sent to me as a personal e-mail.